Includes spring return and lock. Adjustable, hardened spring steel. Strips 10-24 gauge wire. Cuts and strip wires, crimps ignition terminals. Easy-to-read wire size markings. Strips UTP and STP cable up to .24" (6.2mm) OD. Tension release lever, compact design. For use on CAT 3 and CAT 5 cable. Carded. GB Cable Ripper, Premium, 14 - 6 AWG Cable/Wire, 4 in Overall Length, cULus Listed, For Use to Cut Off Cable Jacket Stanley Wire Stripper/Cutter, Adjustable, 26 - 10 AWG Cable/Wire, 5 in Overall Length, V-Notches Jaw, Oil-Resistant Dipped, Comfortable Grip Handle, Vinyl Handle, Yellow Handle, Forged Steel Body, ANSI Specified Tapered nose allows cutting in tight locations. Dual cutting edge and high-leverage comfort grip handle design for optimal cutting performance. Precision-machined and induction-hardened knives strengthen cutters and provide consistent performance when cutting aluminum, copper and medium-hard steel wire. Strips cable, 10-22 AWG wire, crimps terminals and cuts bolts. Easy-to-read wire size markings. Multi-function long nose pliers cut, strip and crimp. Use needle nose to form wire or grip small parts. Strips number 14 - number 16 AWG solid or stranded wire. Crimps insulated terminals up to number 10 AWG. Cuts solid or stranded wire. Serrated jaw and cushioned grips. Rust-resistant steel with cushioned vinyl grip. Easy-to-read wire size markings. Top grade Rockwell 60 steel. Fits tap sizes 6-32, 8-32 and 10-24. Unclogs screw holes, retaps stripped holes. Strips solid or stranded wire. Compact, adjusts to eight wire sizes. Hardened spring steel. Looping hole bends, loops wire for termination on screws. Also includes spring return for easy handling. Cushion grip wire handles. Strips and cuts. Plier nose for pulling and looping wire. Spring return and safety lock. Wire gauge markings on both sides, cuts, strips, and loops wire. Wide handles with cushion ridges designed for comfort. Spring-loaded action returns handles to open position. Narrow nose fits into tight places. Made of hardened steel with precision-ground stripping holes. Black oxide finish. No. 11045 strips solid wire AWG. No. 11046 strips stranded wire. Wire gauge markings on both sides, cuts, strips, and loops wire. Wide handles with cushion ridges designed for comfort. Spring-loaded action returns handles to open position. Narrow nose fits into tight places. Made of hardened steel with precision-ground stripping holes. Black oxide finish. No. 11045 strips solid wire AWG. No. 11046 strips stranded wire. For high-leverage. Cuts up to 3/8" diameter cable. Crimps RG-58, RG-59 and RG-6 F-style connecters. Cushioned grips. Strips insulation, with no damage to wire. Cuts copper wire cleanly. Scissor type blades are precision ground. Lean plier nose pulls, loops wire ends. Highly visible AWG and mm wire gauge sizes embossed in the metal. Comfort grips. For high-leverage. Cuts up to 3/8" diameter cable. Crimps RG-58, RG-59 and RG-6 F-style connecters. Cushioned grips. Strips solid or stranded wire. Laser-etched markings. 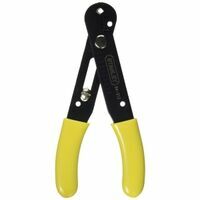 Pliers nose and curved cutting blade aid in pulling and cutting wire. Power spring return reduces hand fatigue. Looping hole forms wire to fit on screw terminal. Wire gauge #10 - #20 AWG. Non-impact punch-down, non-cut 110-style blade used in CAT 3 and CAT 5 terminations. Strips solid or stranded wire 10 - 20 AWG. Precision stripping stations. Laser-etched markings. Pliers nose and curved cutting blade aid in pulling and cutting wire. Spring-loaded action returns handles to open position. Curved high-leverage handles for added comfort. Looping hole forms wire to fit on screw terminal. Cuts and strips RG-59 and RG-6 coaxial cable, multiple size stripping stations strip both the outer jacket and inner conductor. Can be used with both standard and quad shield cable. Hex shaped slot helps push "F" connectors on to cable. Curved cutting blade, spring return. Strips insulation from coax cable. 3.87" height x 1.25" width x .75" depth. Adjusts from 12 - 24 AWG (2.5 - .25 mm?). Gets into tight areas. Wire gauge dial sets stripping dies to proper size, helps prevent nicked wire. Spring-loaded design opens automatically after each action. Yellow handle, 5-1/2" length. Multi-tool strips and cuts wire from 10-22 AWG. Pliers style nose allows pulling and looping wire. Bolt cutter leaves perfect lead thread. Induction hardened cutting edge. Wire crimper for insulated and non-insulated terminals. Meets or exceeds all ANSI standards. Curved cutting blade, strips and cuts copper and aluminum wire, solid or stranded, 10-22 AWG. Precision ground-stripping stations prevent nicking conductor while stripping. Cuts and rethreads bolt sizes 4-40, 5-40, 6-32, 8-32, 10-24 and 10-32. Pliers nose for pulling and looping wire. Crimps insulated and non-insulated terminals. Crimps coaxial F connectors. Curved blade cuts and strips RG-59 and RG-6 coaxial cable. Can be used with both standard and quad shield cable. Multiple size stripping stations strip both the outer jacket and inner conductor. Hex-shaped slot helps push "F" connectors onto cable. Automatic action jaw-loaded stripper grips insulation, strips and cuts solid or stranded 10 to 24 AWG wire cleanly, with one squeeze. Crimps insulated, non-insulated terminals and auto 7-8 mm ignition terminals. Metric and AWG. Strips 10-26 gauge wire. Strips solid or stranded wire. Laser-etched markings. Pliers nose and curved cutting blade for pulling and cutting wire. Power spring return reduces hand fatigue. Deluxe cushion grip. Looping hole forms wire to fit on screw terminal. Wire gauge number 16 - 30 AWG. 6-1/4" total length. Plier nose for pulling and looping wire. Scissor-type cutting blade. Ergonomic-shaped handles. Cuts and strips both solid and stranded wire. Spring automatically spreads handles. Slide lock. Wire sizes embossed in metal. Dimensions 6"/152 mm, minimum/maximum strip AWG 20-10, 0.8-2.6 mm. Strips wire without damage to conductor. Cuts AWG 10-22 wire, bolts 10-24, 6-32, 8-32, 10-32 and 4-40. Crimps coax cable and 7-8 mm ignition cables. Channellock blue comfort grips.Easy-to-read wire size markings. Crimps both insulated and non-insulated wire.